Despite looking like an escapee from a 1950's sci-fi flick, this is actually an extremely versati..
You'll love the way your low back feels after using the Legend 45 Degree Hyper Extension. Sometim.. This is the top-of-the-line, industrial strength grand daddy of the Legend line of glute/ham deve..
You just can't beat the simplicity of the Legend 3160 Oblique Flexor for sculpted oblique muscles..
Two is better than one. We have taken the ultimate dip stand and added another side so that two u.. 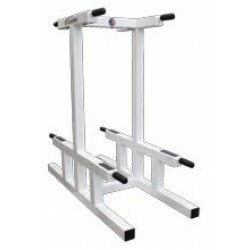 The most affordable posterior chain training tool on the market. Period. As Louie Simmons and.. The Legend 3113 Dip/Ab/Push-Up Station can help you get the job done. This one's a must for every..
A big hit in the CrossFit community this GHD is our most economical solution for exercising the c.. Forget everything you've heard about being one-dimensional. Add the mighty mite to your arsenal. .. The Legend Dip, Chin & Push-Up Station keeps it simple and appeals to those who still enjoy t.. Your legs won’t call this a Sissy Squat. Talk about a direct transmission of resistance to your l.. If you really want to dig deep on those squats, but then maybe also want to have the ability to d..